Ah, the Olympics. Such a grand time for our nation! We parade out men and women who are paid nothing for the sport to which they dedicate most of their lives and we watch them for a few minutes every four years and claim national pride and love. Also we like to cry at the stories of human endurance and the spirit of triumph because we make their journeys so expensive and difficult that they're murderously sad. And then we get to fist pump American tenacity. I love us. This year, we have an added benefit: mock outrage that the uniforms were made in China! And anyone who jumps on this bandwagon gets a gold medal for not using their brain. Here's a super duper quick lesson: (I didn't spend a lot of time here because this is a fake "problem" with fake "outrage.") The average textile worker in America made a whopping $575 A WEEK in 2011, according to the National Council of Textile Organizations. Oh those American workers, in hot factories, demanding higher wages, probably requiring safe environments with machines that won't accidentally cut off their arms. Compare this to the Chinese textile industry where a 23% raise to one company's workforce resulted in a 2,000 yuan per month wage. And just because I'm very, very nice I did the conversion for you. Awright. So I think we can understand now why we've lost all our jobs. $575 per week equals $2,300 per month, compared to a Chinese income of $313 per month. Gimme a break. We're the land of Walmart shoppers! We don't want to pay $25 for a shirt made in America so an American could be paid a still sub par wage at $2,300 a month! We'd much rather pay $4 for that shirt and blindly go along thinking about all the Walmart workers we're helping to employ than remember we helped send a Chinese worker the $313 a month that THEY need to survive. Holy crap...I just led us into a "we're part of a human family" sort of discussion. This isn't where I meant to go, because obviously I'm trying to remind everyone that WE are the reason why jobs are shipped out. Hang on, let me cycle back. I don't want to pay a lot for my crappy t-shirt. Or my crappy melamine plates, or my crappy toys. I plan on throwing all of them away in a few months and so I don't care how well they're made. Ergo, I want to pay as little as possible for them. I continue to choose products made in China to increase my bottom line, and here's a newsflash: so do corporations! I don't know if the populace at large gets this, but corporations are here to make money. For themselves and for their shareholders. When I buy from them I encourage them to continue their business as usual. It's not all about the tax breaks they're getting for outsourcing, although that's part of it because hey...it increases their profit margins. And, as much as we hate to admit it, because when we grandstand we like to suddenly reclaim our Norman Rockwellian heritage, we all might have to agree with Will Cain. He's a columnist for TheBlaze.com and he said, "I know you can find some companies that are based in the United States that can manufacture clothing, but we just don't do this. It's not what we do anymore - we do ideas." So why the outrage? Why the mock indignation? We're pointing a finger and conveniently forgetting that the three wrapped around our wallets are pointing right back at us. 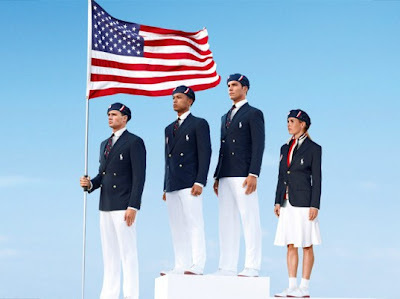 These Olympic uniforms are no different than the American nurse's uniform or the American pilot's uniform....or the American textile worker's uniform for that matter. It's all freaking made in China, because that's where Americans make their stuff. It's time to move on from an issue that was never worth talking about in the first place. Now go back to the point I made about the "human family" thingee....I wanna end there. Want a dirty box? Remember to verify! I wrote this stuff...except for what I didn't. Don't copy it unless you give me overwhelming credit. Simple theme. Powered by Blogger.